Most barefooters are aware of Abebe Bikila, who won the 1960 Olympic marathon running barefoot. The shoe sponsor had run out of shoes that fit, so Abebe ran barefoot, the way he had trained. But there was another barefoot runner at the time. His name was Bruce Tulloh. Here is a very nice article about him: Olympic memories of Barefoot Bruce, the original Forrest Gump. He trained on a beach in north Devon, England, and they also had grass tracks. His best year was 1962, when he ran six miles in 27 minutes 57.4 seconds at the British games. That was the best time of anybody for the year. He also won the gold at the 1962 European Championships in the 5000m. 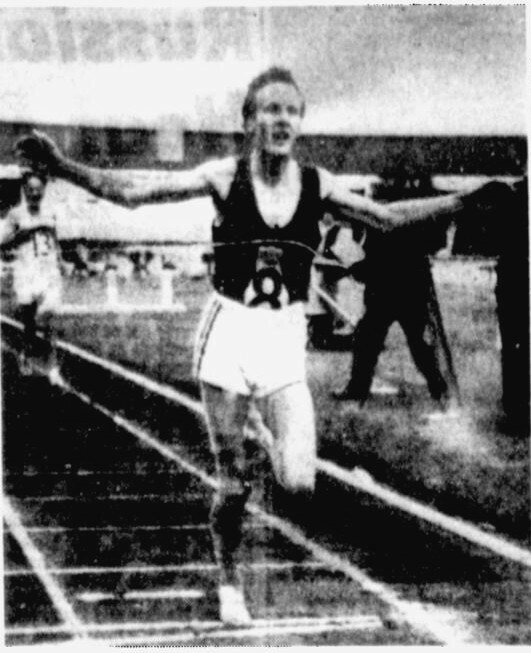 LONDON, June 19—Bruce Tulloh, shown breezing across finish line in the British Games, claims the only way to run is barefooted. He makes a good case for himself, too. Tulloh clocked 27:57.4 in winning the six-mile grind and that’s the best in the world this year. “The important thing about running barefoot is that it makes you feel free,” he said. Unfortunately, he didn’t do too well in the Olympics. In Rome’s sweltering heat, Bruce just missed qualifying for the final. After getting the measles, he didn’t make the 1964 team. Interestingly, he did inspire a few other folks to run barefooted. Here’s a paragraph from another article I found. As for shoeless running, Tulloh might have started a trend. An Irishman named Jim Hogan now runs barefooted and recently came in third in a race behind Tulloh and a runner wearing spikes. That article, from 1962, also has Tulloh acknowledging that he’s considered a bit of an eccentric when he runs. But it also describes his barefoot running. “There’s no joke about it,” said Tulloh. “I run better in bare feet. It’s as simple as that. I took off my shoes originally when I was running on grass a long, long time ago. Now nothing bothers his tootsies. During May he ran about 240 miles in training on cricket fields and in woods, mostly in bare feet. “They’re as tough as leather now,” he observed. At the moment, Tullow is the fastest man in Britain at the one mile, three mile, and six mile distances. The reference to Forrest Gump is because in 1969 he ran from Los Angeles to New York in 65 days, beating the old record of 73 days set in 1964 by Don Shepherd of South Africa. As far as I can tell, he did not do that run barefoot. In his late 70s, Bruce still competes occasionally (according to this Wikipedia article).